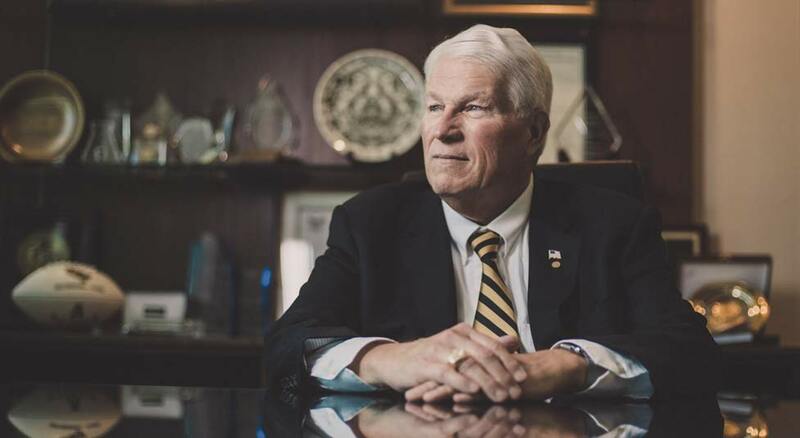 After 25 years as president of UCF, President John C. Hitt still believes there is no better tool than a college degree for improving social and economic mobility. 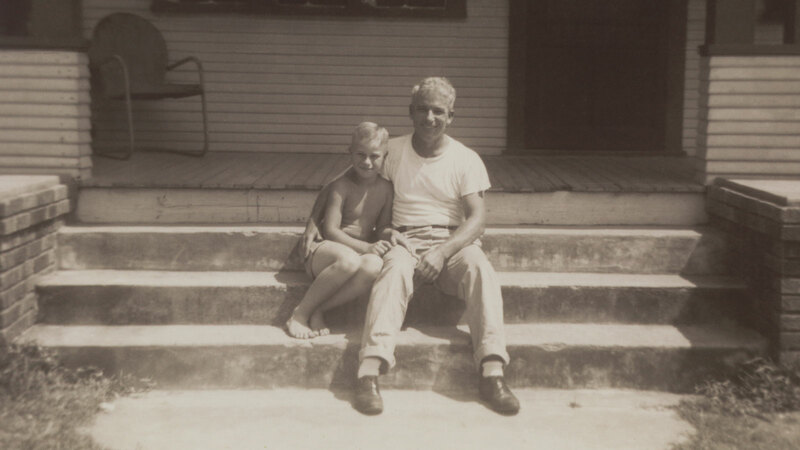 (Photo above) President Hitt sits with his father, John Hitt Sr., on the front porch of their Houston family home in the mid-1940s. President Hitt was the first in his family to earn a college degree. My family was of modest means, and my father’s dream was for me to go to college. After he died, my mother helped me become the first in my family to earn a degree. My dad has been gone for more than 60 years. But I still sometimes wonder what he would think about my life and career. Would he be proud of me? I hope he would see that I try to make a difference in people’s lives. That I care about our community. That I give a damn. I give a damn because I know, after 25 years as UCF’s president, that our mission is more important than ever. In the United States, there is no better tool than a college degree for improving social and economic mobility. Imagine two students with equal ability. If one graduates from college and the other doesn’t, guess what? The one with a college degree, on average, makes substantially more money. Bureau of Labor Statistics data from 2015 show that college graduates’ earnings averaged almost 70 percent more than high school graduates’ pay. A college degree creates value. It also creates values. College helps students grow intellectually, emotionally and socially. It helps them hone critical-thinking and problem-solving skills by exposing them to different people and ideas. A more educated population results in more engaged citizens and a stronger democracy. Like many people, I also enjoyed an extra college benefit: It’s where I met my wonderful wife, Martha. She was two years ahead of me but was willing to take pity on a poor sophomore. We dated, fell in love and have been married for 55 years. With all of the benefits higher education offers individuals and society, one question has always bothered me: Why do so many universities pride themselves on whom they keep out? The standard practice for decades has been for institutions to boast about how exclusive they are and how many applications they reject. Why do so many universities pride themselves on whom they keep out? If higher education is such a powerful force for good in the world, shouldn’t we make it more accessible? Shouldn’t we strive to transform more lives and communities? I certainly think so. Of course, I’m as proud as any university president about the quality of our students. Twenty years ago, the average incoming UCF freshman was a B student. In 2016, the average GPA was a 4.0. But we also make this promise to students who, for whatever reason, choose a different path to their degree: If you work hard and successfully graduate from a local state college, we have a place for you at UCF. This dual approach has fueled our growth to more than 64,000 students, making UCF one of the largest universities in the nation. But size alone isn’t enough. We are in the business of demanding excellence, too. This is something I first learned from my father, who ran his own printing business. Dad would pay me a dollar for every 1,000 prints I made that were good enough to sell. That’s where I learned a good lesson: Making a lot of something is not necessarily worth anything — unless it’s excellent. Admitting and graduating a lot of students isn’t worth anything unless they receive an excellent experience. At UCF, we ensure students learn from the best professors, secure meaningful internships and graduate on time. We also prepare students to begin or advance in rewarding careers or continue their educations. I’m proud that more students are applying, staying and finishing their degree than at any time in the history of UCF. Florida recognized our efforts in 2016 by naming UCF the best-performing university in the state system for the second time in four years. UCF is the only institution to be in the top three every year the rankings have been in place. Simply put, we are here to make a better future for our students and society. And we won’t be successful without more of us living up to our full potential. I believe everyone has potential. And when more people unleash their full potential? My father provided me the precious gift of a college degree. His dream changed my life, and as president I am dedicated to providing that same opportunity to sons and daughters everywhere. It’s why I give a damn. Dr. John C. Hitt was president of UCF from 1992-2018. He graduated from Austin College with a bachelor’s degree in psychology and earned master’s and doctoral degrees in physiological psychology from Tulane University.